Andrea Mitchell conducted by far the better of the two interviews, often challenging Clinton’s false claims which were accepted in the AP interview. The most complete transcript I could find of the interview with Andrea Mitchell at time of writing this post is available here. First of all, are you sorry? Do you want to apologize to the American people for the choice you made? HRC: Well, it certainly wasn’t the best choice. And I have said that, and I will continue to say that. As I’ve also said many times, it was allowed, and it was completely above board. The people in the government knew I was using a personal account. But it would’ve been better if I had two separate accounts to begin with. And certainly I’m doing everything I can now to be as transparent about what I did have on my work-related e-mails. I think, you know, they will be coming out. I wish it were a little bit faster. It’s frustrating that it’s taking a while. But there’s a process that has to be followed. Eight months after you took office, the U.S. Code of Federal Regulations was updated to say that agencies that allow employees to send and receive official electronic e-mail messages using a system not operated by the agency must ensure that federal records sent or received on such existing systems are preserved by the appropriate agency recording system. So there were a lot of advisories. No laws, correct. But a lot of advisories, written White House guidance, against using personal e-mail, and especially using personal e-mail exclusively. Fact check sites have also debunked this claim from Clinton whenever she made it, including after her interview with CNN. This includes both Factcheck.org and The Washington Post Fact Checker, which gave Clinton Three Pinoccios for her statement that “everything I did [on e-mails] was permitted.” Previously the top Freedom of Information Act official at the Justice Department stated that Clinton was in violation of the rules. Clinton also said, “I wish it were a little bit faster” in response to the release of her email. She has frequently made such misleading comments to suggest that she has wanted her email to be released after initially trying to prevent the release. If she was concerned about speed, she might have also turned over the electronic version of her email as opposed to printing it out and forcing the State Department to rescan the documents. The manner in which Clinton did release the email did make it easier to hide alterations. Clinton similarly was deceitful in talking about turning over the server in the AP interview, with Clinton refusing to turn it over until she had no real choice with the FBI beginning its investigation. Mitchell later asked Clinton about the over 30,000 emails which were deleted. Clinton repeated her claim that they were personal, but it has already been found that email related to Libya and terrorism had been deleted or altered. Mitchell asked Clinton about the classified email which has been found on her system, with Clinton again giving a misleading answer: “And has been confirmed repeatedly by the Inspectors General over and over, I did not send or receive any material marked classified.” This has not been confirmed at all, with the Inspectors General requesting that the FBI investigate the matter. It has been revealed that there were 213 classified emails in the email reviewed so far, with two emails labeled top secret. It is not yet known how many were labeled classified at the time, but as Secretary of State, Clinton was responsible for knowing what information should be classified regardless of whether it was labeled as classified when she sent the information. AM: You have said that Colin Powell did the same thing. He actually had a personal e-mail and a State .gov official e-mail system. So he didn’t just rely on a personal system. I don’t think there’s any precedent for someone just relying on a personal e-mail system at your level of government. 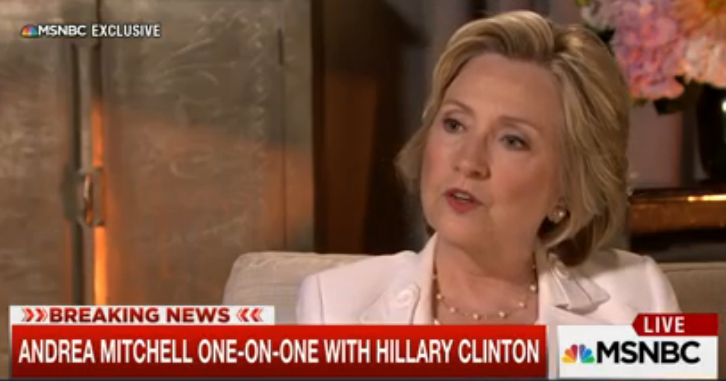 HRC: You know, I was not thinking a lot when I got in. There was so much work to be done. We had so many problems around the world. Clinton again made an issue of the “secret White House email accounts” in 2008 when running for the nomination. In response to the Bush email scandal, the Obama administration instituted new rules to provide for greater transparency. It makes no sense to say she just didn’t think about it when the Obama administration was sending out advisories and working on new policies regarding this. Andrea Mitchell then asked, “Does it raise judgment questions?”While Clinton denied it, the entire scandal shows a profound lack of judgment even beyond the violations of several government policies. Knowing that this was a scandal before she took office, she should have realized that it would ultimately come out that she was going even further than the Bush administration in violating basic principles of government transparency. She’s made some huge mistakes in my judgment. And that wonderful interview that Andrea initiated, and typically of Andrea she went right after the issue, when she said, I didn’t think about the effect of e-mail, I was stunned. I mean, we were deep into the digital age at that point. She’s Secretary of State. If the Democrats are foolish enough to give the nomination to Hillary Clinton, coverage of the campaign will continue to be dominated by questions about Clinton’s honesty and judgment.